I always understand and work to remember that everyone has different tastes, but I have to admit I was absolutely baffled when it came to my attention that there are folks out there who don’t enjoy the Wayward Children series by Seanan McGuire. And then I remembered that not everyone is me, and while I don’t get it, I accept it. That being said, as I said in the title, these books are practically custom-made for me. Every kid who finds a world in these reminds me of my childhood self in some way, and this book is the very best example of that yet. I practically WAS Lundy growing up, minus any desire or thought about having kids. I understood so well why the world presented to her through a door in the woods would be so tempting, and why it would be such a hard decision to figure out which world was the right one to live in. You’d think that with books I enjoy so much, I’d always wish they were longer: most of the books in the series are just a bit over novella length. But I think their length works so well for them! I want details about the worlds McGuire creates, but I don’t want TOO much detail, and more text might allow for so much information that the mystery and allure of them gets ruined. I’m left wanting to know more about what happens and more about the people in any given world, but I’m satisfied by what I got. The length seems artfully done to me. Anyway, I hope there are more of these to come, I’d basically read them forever as long as they don’t jump the shark in some really awful way. And now I’ve jinxed myself. Share the post "These books are almost custom-made for me"
Intriguing! 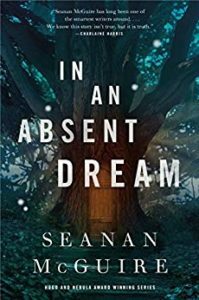 Is “In an Absent Dream” the first in the series? I’ll put this on my to-be-read list! It’s the fourth. Here’s the whole list. Hope you enjoy them! “these books are practically custom-made for me” — omg that’s exactly how I feel about this series, too! I’m glad I’m not the only one! They make me so happy. I devoured this one in about four hours.